President Ishii (right) speaks with a member of the Omaha Sister Cities Association during a celebratory luncheon. 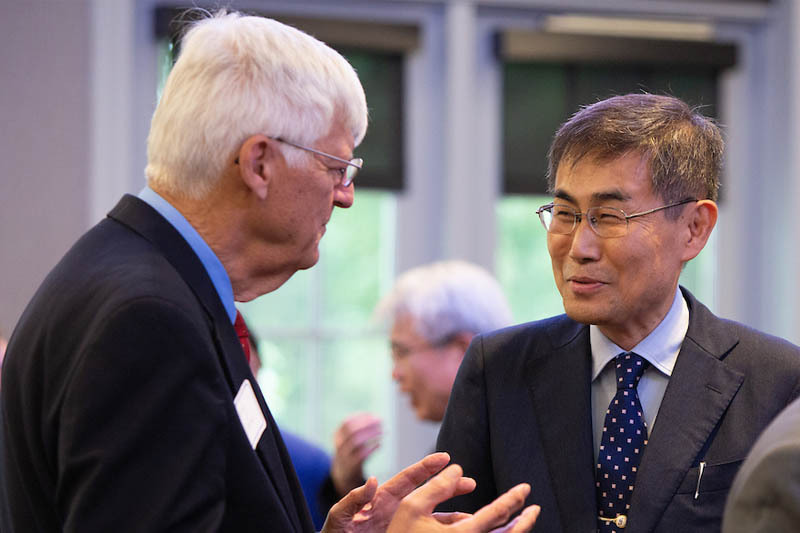 President Ishii (left) meets with Halla Kim, UNO associate professor of philosophy, during a luncheon celebrating UNO and Shizuoka's 39-year partnership. President Ishii, speaks to a room of guests from UNO, UNMC and Shizuoka University. 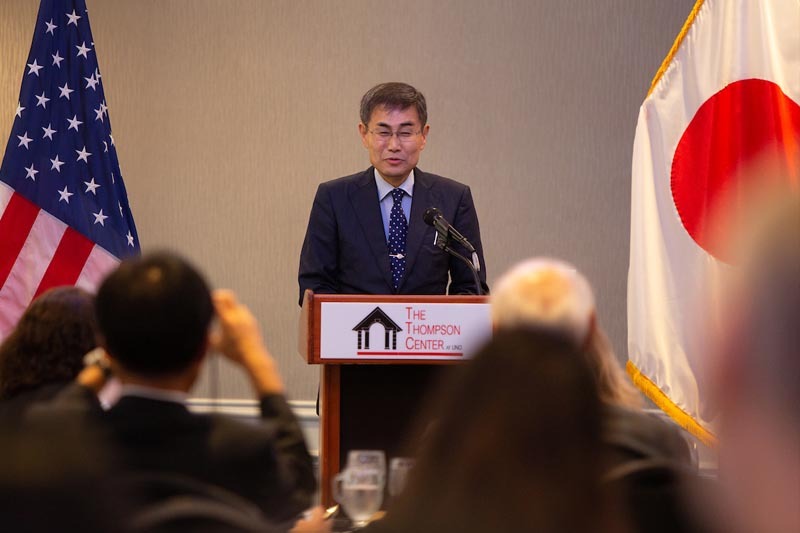 "This relationship is very important to us for international strategies and that’s why I visited here to see Omaha’s people directly and get their feedback," he said. President Ishii and a delegation of professors from Shizuoka University meet with B.J. 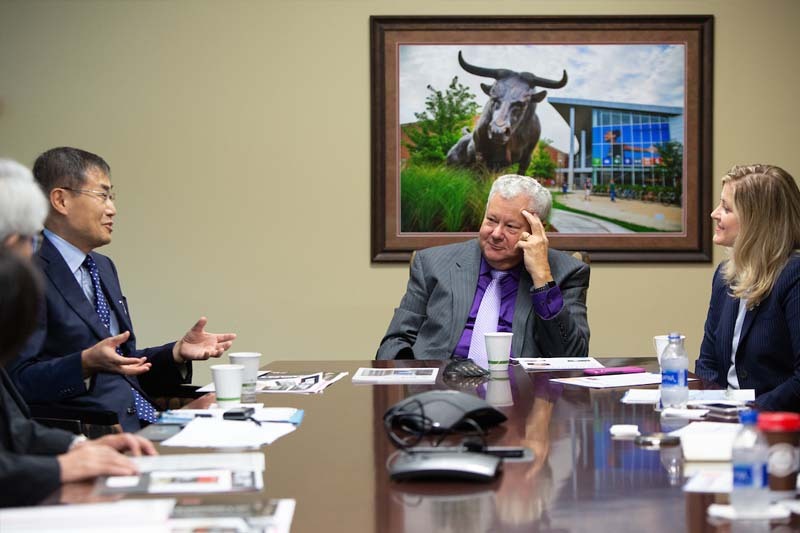 Reed (center), UNO Senior Vice Chancellor for Academic Affairs, and Jane Meza (right), UNO and UNMC's Associate Vice Chancellor for Global Engagement. 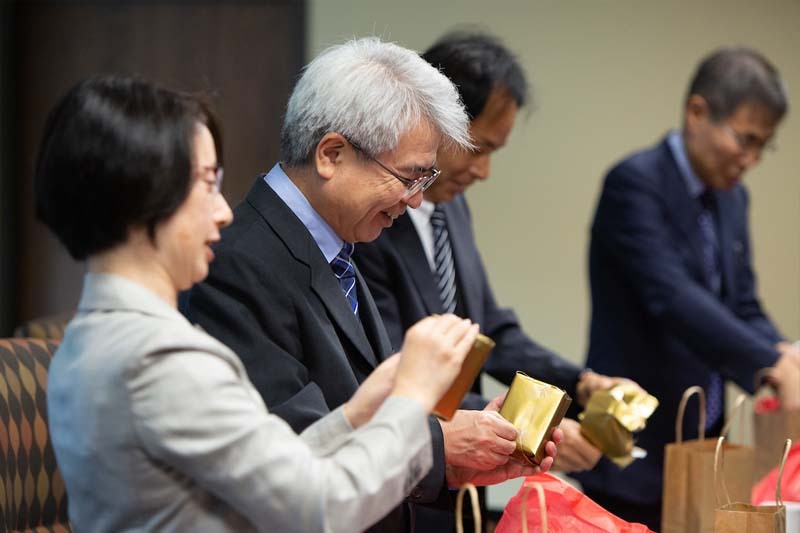 Representatives from Shizuoka University exchange gifts with UNO administrators and staff. The two universities signed a formal sister university partnership in 1979. For nearly 40 years, two campuses more than 6,000 miles apart have maintained a strong and lasting friendship that has helped support thousands of students. 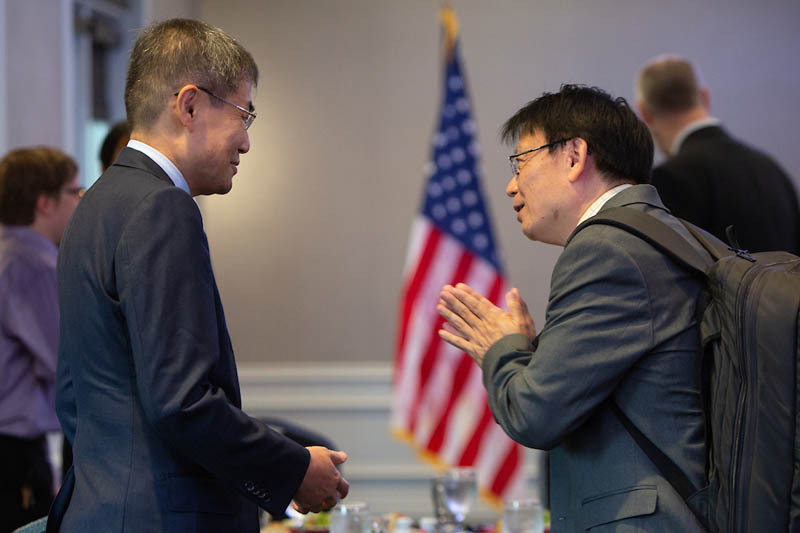 Recently, UNO celebrated the 39th anniversary of its partnership with Shizuoka University by hosting Shizuoka University President Kiyoshi Ishii on his first visit to Omaha. The visit coincided with a three-day event celebrating Japan’s ties to the Midwest, which concluded on Tuesday, Sept. 11. The 2018 Midwest U.S.-Japan Association Conference, hosted this year by Omaha, celebrated 50 years of bringing together government, economic and educational leaders from across the region to discuss how the two countries can best work together. Omaha and Shizuoka’s relationship is slightly older, officially coming together as sister cities in 1965 following a 1950s initiative launched by President Dwight D. Eisenhower to improve international relations. Shizuoka, Japan, is one of the country’s largest and most populous metro areas. Located 113 miles southwest from the capital of Tokyo, Shizuoka is perhaps best known as the home of Mt. Fuji, the instantly-recognizable 12,389-foot volcano that stands as the country’s tallest peak. For both Omaha and UNO, Shizuoka marked the very beginnings of formal international partnerships, which has since led to the formation of the Omaha Sister Cities Association and UNO’s extensive education abroad program, which features hundreds of exchange options across more than 30 countries. During his visit, Ishii met with UNO administrators and staff members; participated in a tea ceremony hosted at UNO; celebrated the 39th anniversary of UNO and Shizuoka’s partnership at a special luncheon; and was also able to present for the community at the Weitz Community Engagement Center. Officially, UNO and Shizuoka University began their partnership in December 1979, but as far back as 1965, students from both universities were traveling to each other’s’ campuses. Today, dozens of Shizuoka students travel to Omaha each year to participate in a summer experience program where they study at UNO and travel across Nebraska. Additionally, many UNO students who originally traveled to Shizuoka for their education have returned and built lives for themselves halfway across the world. “As I look back over the past four decades of collaboration, it is clear there is no greater testament to the success of our two campus’ commitment than the people it has impacted,” Chancellor Jeffrey P. Gold, M.D., said. Ishii agreed, adding that many UNO students have become Japanese citizens following their experiences at Shizuoka University. Ishii added that he hopes the longstanding relationship between the two universities will find new and unique ways to collaborate, not just through educational experiences, but also faculty research and cross-campus initiatives that benefit both regions’ workforce. Ultimately, Ishii said the most important result of UNO and Shizuoka University’s partnership has been the opportunity for students to form their own views and perspectives that can help both countries move on from the difficult past relationships of previous generations. "The overall Japan-to-US relationship is a very important relationship. I hope our students learn their history and they see directly, the U.S. society through their own eyes so that their judgement on what is right and what is wrong from their own experiences and knowledge."